Ortansa Moraru was born in 1968, in Romania. After working as an Art Teacher at the “Marin Sorescu” High School of Arts in Craiova, Romania, she immigrated to Canada and worked in Toronto since 2002. She was awarded with the first Scholarship in 1993 at the 4th European Biennial of Fine Arts Academies in Maastricht, Holland, in the Masterclasss Section, Professor Luciano Fabro. Another two Scholarships were awarded to her from the “Dante Alighieri” Cultural Society in Rome, Italy, in 1996 and 1998. She is a professional artist with exhibitions across Europe, Asia and North America. Since her arrival in Canada, Moraru was awarded with the Third prize in Italy at the IV International Biennial of Graphic Arts, Francavilla al Mare in 2006 , Juror’s Award in 2007 at the Glenhyrst Art Gallery, at the Juried Drawing Exhibition, Brantford, Third Prize-Abstract at The Society Of Canadian Artist’s 41st Open Juried National Exhibition Todmorden Mills, Papermill Gallery and the Arts / Social Justice Award of the National Ethnic Press and Media Council of Canada presented by the Lieutenant Governor of Ontario. She is a member of the Society of Canadian Artists, Drawing Society of Canada and Ontario College of Teachers. Printmaking has always been a special medium to me. I have found inspiration in my surroundings. I also enjoy drawing, which strongly influences the two techniques involved when I dream compositions, envision spaces and feel surfaces: woodcut and lithography. The woodcut is the technique through which I have reinvented myself, maybe because of the urge to wrestle something – working against the grain being a dialogue, miraculously balanced by the spectacular results in the quality and accuracy of the cut. What a wandering and then what a comeback among woodblocks and Japanese paper whiter than white in contrast with the black of the ink. Many of my prints depict the garden, the imaginary island, the ark or the solitary hills I was never able to conquer. The old wood blocks lay quiet and tidy on a shelf, waiting for a sign. Only the hands are tireless; they toil, the same as when I was living on the other side of the ocean, above the new wood blocks, lengthy polished with patience and steady believe in tomorrow. I know that tomorrow I will be printing (by hand), centimeter by centimeter, a series of new woodcuts that will travel the world telling stories. 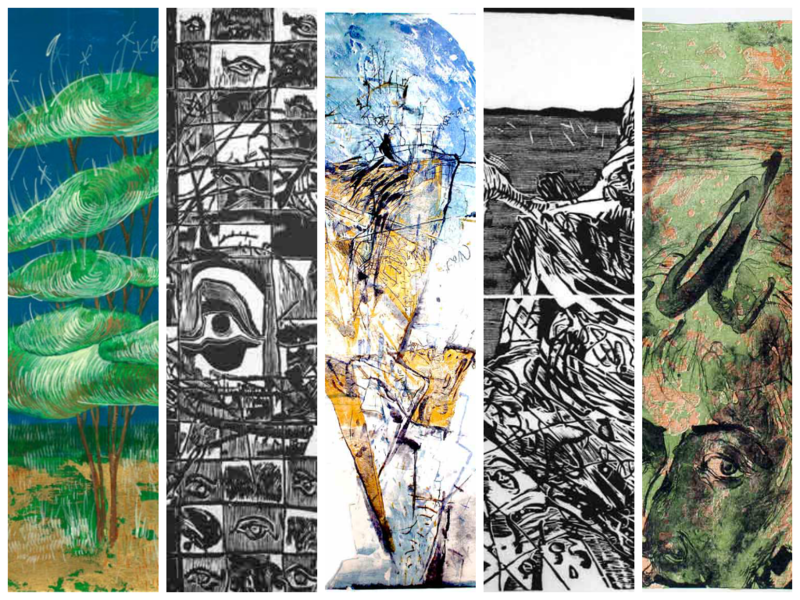 Lithography, intaglio, xylography (woodcut), linocut, monotype. 1998 Dante Alighieri Cultural Society, Rome, Italy – Italian Language and Culture Study. 1996 Dante Alighieri Cultural Society, Rome, Italy – Italian Language and Culture Study.